The Enugu Diocese of the Anglican Communion has warned the Economic and Financial Crimes Commission, EFCC, to stop “witch-hunting” the Deputy President of Senate, Chief Ike Ekweremadu. The Church asserted that the lawmaker has had no trace of corruption since his political life. According to the Church, what agencies of the Federal Government were doing to the Enugu-born politician was intimidation and an extension of the emasculation of the Eastern region, which if stretched further could result in the dismemberment of Nigeria. The Church said this on Sunday evening when it paid a solidarity visit to the Deputy Senate President in Enugu. The Church delegation comprised the Archbishop of Enugu Province and Bishop of Enugu Diocese (Anglican Communion), Most Rev. Dr. Emmanuel Olisa Chukwuma, Archdeacons and Canons of the Province. Leader of the delegation, Archbishop Chukwuma said: “We are here to tell the world that you are a true child of God who nobody should find a way to rubbish. “As far as we are concerned with your credibility and integrity, we have not heard since you started your journey as the local government chairman, moving to becoming Chief of Staff, Secretary to the Government of Enugu State to what you are now, there is no record, and nobody has ever heard that you stole money anywhere. “When we heard the list of those, up till now, published of those who embezzled money in the 2015 election, we didn’t find your name there and so we are embarrassed when they say EFCC. “What is EFCC looking for? EFCC should please leave Ekweremadu alone because his name was never mentioned anywhere. “We feel that this is a vindictive act; a jealous spirit against the leadership of the Igbo politicians and against us as Christians. EFCC should stop intimidating people if we are going to have a good democracy in this country. They should stop this idea of witch-hunting. “In the government of Buhari are those they should witch-hunt and nobody can force you to join APC if that is what they want. “You have been a stakeholder in PDP and you have remained firm; you have not cross-carpeted and you will never cross-carpet and so they should leave you alone. “As far as we are concerned as the Anglican Church, we stand behind you. 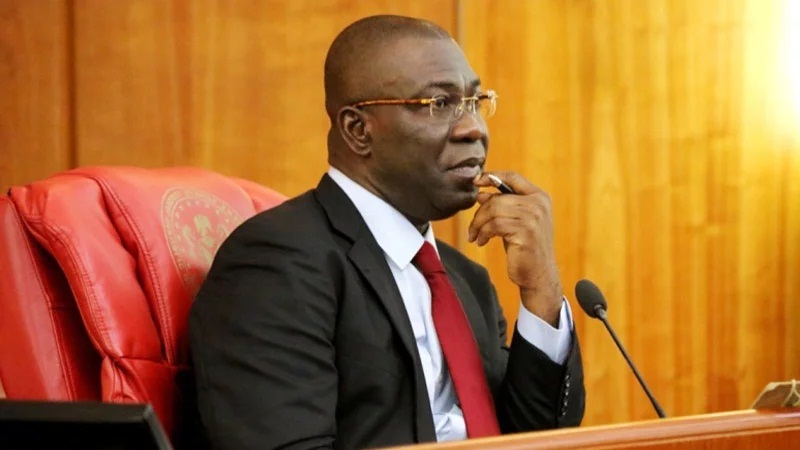 We call on the Federal Government to leave Senator Ike Ekweremadu alone and stop witch-hunting him for nothing. “This is witch-hunting and we have no apology for the Federal Government. But what we say is that they leave us alone. All we want is peace in Nigeria, and you cannot continue to stand firm in fighting for the unity of Nigeria and somebody is trying to intimidate you. “You are a Senator that has done very well in his senatorial zone and is in constant touch with his constituency. Other senators should emulate you. We will very much support you in prayers and we are proud of you. “If anybody touches you, they are touching the eyes of God; they are touching the eyes of Ndi’Igbo and we shall not take it for granted. They should allow peace to reign and Mr. President should please warn the security people. The security people should please know where to go. Benue and Plateau have been burning and nobody has gone there to lay siege. “All the defections are a result of people saying they are tired of this government. It is a negative report. Jonathan withdrew and exited for peace to reign. “There is no peace, there is no security, the economy is bad, there is no employment, and the appointments in this government are all northern and northern. We are being marginalised and we cannot stop saying it. “South East is being marginalized and now it is victimizing our own very best person, we will not take it. “We pray that God Almighty will touch their hearts because if care is not taken, the way things are going now will result into a serious, not only religious war, but a serious war that will never make Nigeria to be united. “So, to save Nigeria, we must renegotiate it and restructuring must come. That is where we stand for peace to reign.